It's a long time since I posted anything about "travels", which is a bit remiss of me, considering that my blog claims to be about "Gardening, food, cookery, family and travels". 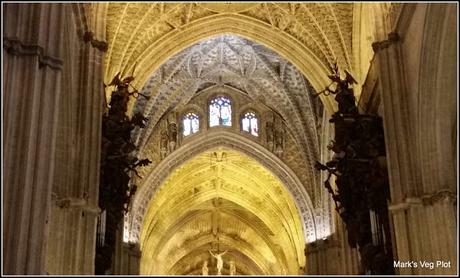 Today, I offer you a few words about our recent trip to Seville (Spain!). 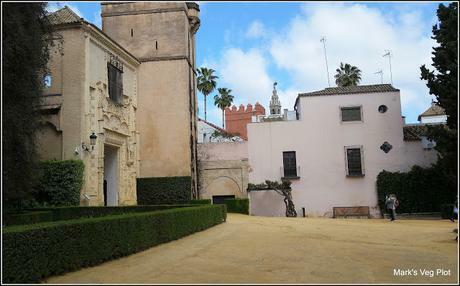 On our first full day in the city we all did a guided tour of the Alcazar (castle or fortress) and the cathedral. It was a private tour - just the guide and six of us (Jane, me, Fiona, her husband Juan and their two children). We felt this was so much nicer than being in a huge gaggle of 'miscellaneous tourists'. 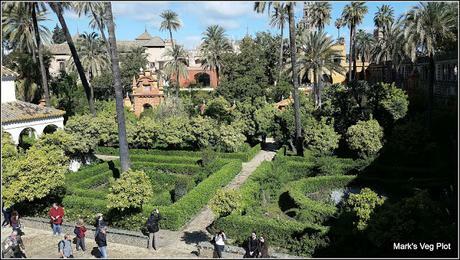 According to Wikipedia: "The Alcázar of Seville is a royal palace in Seville, Spain, built for the Christian king Peter of Castile. 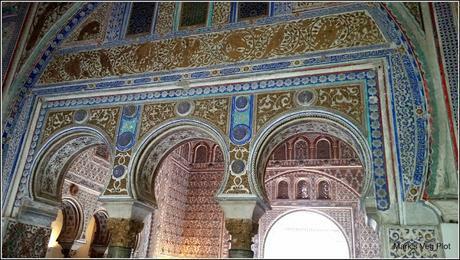 It was built by Castilian Christians on the site of an Abbadid Muslim residential fortress destroyed after the Christian conquest of Seville." The architecture of the site is exceedingly complex - a mix of Moorish and Christian styles, closely interwoven - often deliberately so. The Islamic elements all use non-permanent materials (e.g. brick, plaster), and deliberately avoid things like stone, because apparently only Allah can achieve the perfection of permanence. Curiously, the Islamic architects had no qualms about using permanent materials that were already in existence, such as "recycled" Roman stone, whereas they would not use newly-quarried stone. This is the Puerto del Leon (Lion's Gate). Here is in the room in which the expeditions of Christopher Columbus, Ferdinand Magellan, Amerigo Vespucci etc were discussed and approved. 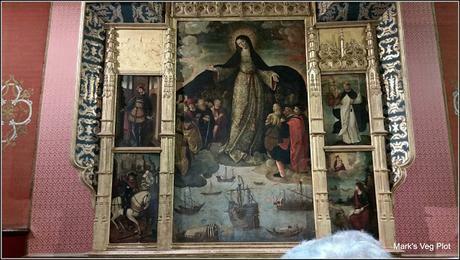 The painting illustrates the men, the types of ship they used, and the saints that were said to watch over them. 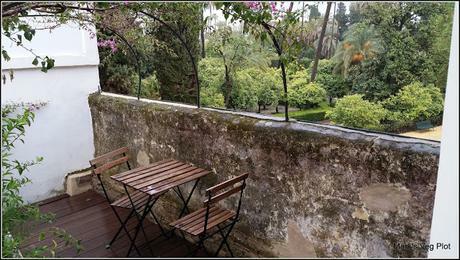 This is the Patio de las Doncellas (Courtyard of the Maidens), featured prominently on Monty Don's recent TV programme Paradise Gardens. 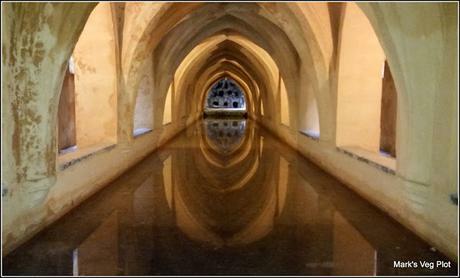 This is the subterranean pool, lit and cooled entirely by overhead vents. It must have been a haven of cool tranquillity in the sweltering heat of the Summer (though it was distinctly chilly at the time of our visit!). 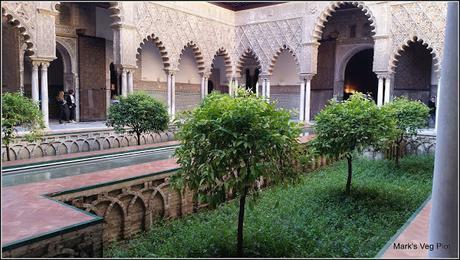 To be honest, I felt that the gardens of the Seville Alcazar were a bit underwhelming in comparison with the buildings. To me they seemed too formal and lacking in color and variety of texture. 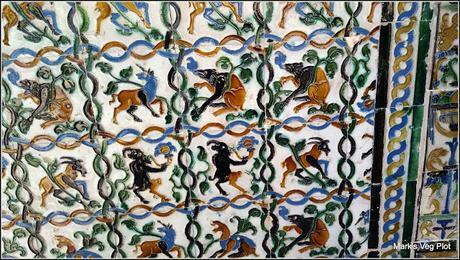 14th-Century tiles. Notice the unicorn! Our guided tour moved on from the Alcazar to the nearby cathedral, dominated by the soaring tower of La Giralda, originally the minaret of an Islamic mosque constructed in the 12th century, but subsequently adapted into a Christian bell-tower after the city was recaptured from the Moors in 1248 during the Reconquista. 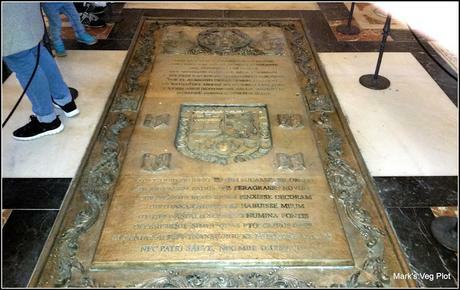 And this is the tomb of Diego, son of Christopher Columbus - some of whose remains reside in a very impressive casket borne by sculptured figures representing the four kingdoms of the united Spain: Castile, Leon, Navarre and Aragon. The day after our visit to the castle and cathedral, we walked to the Parque Maria Luisa, a huge park allegedly inspired by the Bois de Boulogne in Paris. We had tried to visit this on our first day, but it was closed due to the dangers of falling trees / branches posed by strong winds! 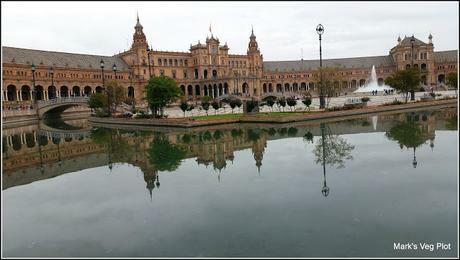 Without a doubt, the centrepiece of the park is the Plaza de Espana - at first sight a very imposing royal palace, though in reality an artificial one created for the huge Ibero-American Exposition in 1929. 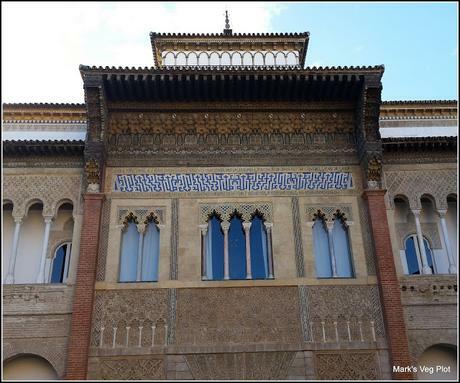 The front face of the lower levels of the semi-circular building is comprised of sumptuously decorated alcoves representing all the cities of Spain, arranged in alphabetical order. 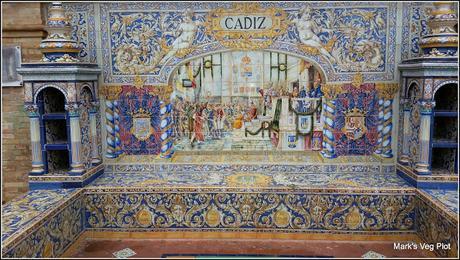 As in so many other parts of Seville, the primary artistic medium is the glazed tile. 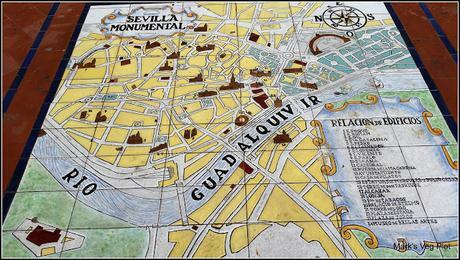 There was even an early 20th Century "Tourist Map" of the city, made of ceramic tiles! With two young children in the party, we didn't want to devote too much time to looking at old buildings, so after a short stint on the park's play equipment, we took taxis to the Triana district in order to visit the market. 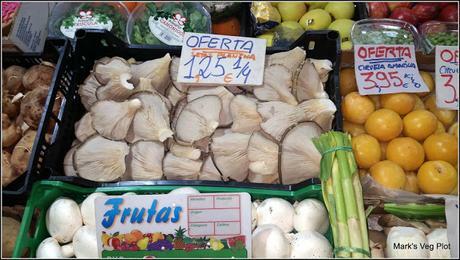 The Triana district has two markets, one of which has evolved into what most people would call a Food Court, consisting primarily of cafes and bars, but we visited the other one - the place where real local people buy real ingredients. I love visiting this sort of place! We stopped at a little café to have some coffee and ended up staying there a couple of hours and eating a wonderful lunch prepared from ingredients fresh from some of the other market stalls. The café proprietor was exceedingly helpful. 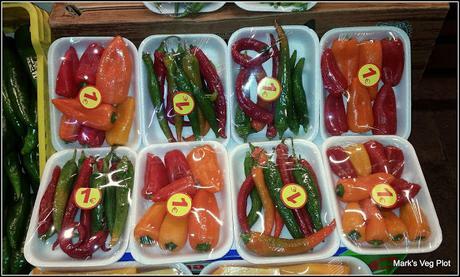 He said basically "Have a look at the market; if you see something you want to eat, come back and tell me. I will go and buy it and cook it for you." And he did! 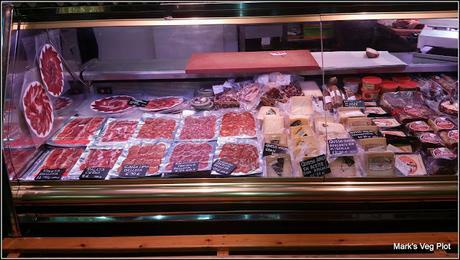 We ate vast quantities of meat and fish... (with me avoiding the latter, as ever). When the time came to head back to the airport we experienced a few moments of anxiety when we found that the city center was blockaded by stationary taxis whose drivers were staging a strike. However, we did eventually make it to the airport in a pre-arranged chauffeur-driven car, although the journey took much longer than anticipated. 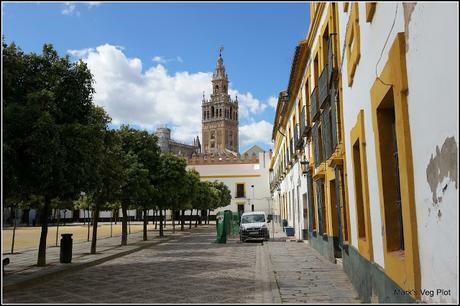 We loved what we saw of Seville. There is a lot to see and much of it is very conveniently situated in a smallish area, making walking from place to place a viable option when the weather is OK. Maybe we need to go back some other time, when the weather is better?? ?